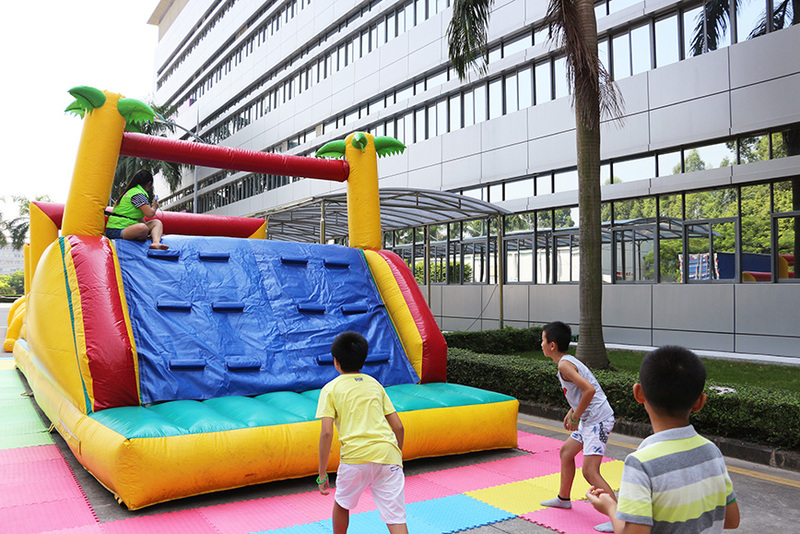 In order to enrich children's vacation life and have a full and meaningful summer vacation,our company carried on an unlimitedly funny summer camp activity on July 30 in ShenZhen BanTian factory. At 9:30 in the morning,children from HuiZhou came to ShenZhen by two buses and joined up with ShenZhen children in BanTian factory. A interesting game officially started.Under the guidance of the teacher,kids grouped and finished many full of challenging and endless joy games,such as use wisdom and brave to make a breakthrough,Sudoku,across the river by touching stone,be in the same boat, three-dimensional connect four, joy's Jump Ball and so on. The slogan of "come on" was resounding constantly, and laughter filled the entire BanTian factory. At noon, kids had a meal on the first floor buffet restaurant of staff canteen. The canteen is clean and supplied various food with completed nutrition.Under the guidance of staff ,kids orderly queued, civilized dining,which displayed a warm harmonious scene in canteen. After having a brief rest in the dining room,kids began to play puzzle game to exercise practical competent. With the help of the teacher, the kids have successfully completed their own puzzle works. Then a collective game-invincible hot wheels tests kids' precious quality of solidarity and collaboration. Through this summer camp, kids learned appreciation,listening,and met more new friends.Puzzle game exercises their practical ability and creativity,and collective game makes them know the force of unity.Although a day of summer camp is over, the children grow up in the game, looking forward to next year's summer camp more rich and colorful.